Proposed fuel economy and greenhouse gas emissions standards would increase fuel economy and reduce diesel consumption in medium- and heavy-duty vehicles. Unlike light-duty vehicles, which have been subject to fuel economy standards since the 1970s, the first phase of medium- and heavy-duty vehicle standards was recently implemented, starting with model year 2014. 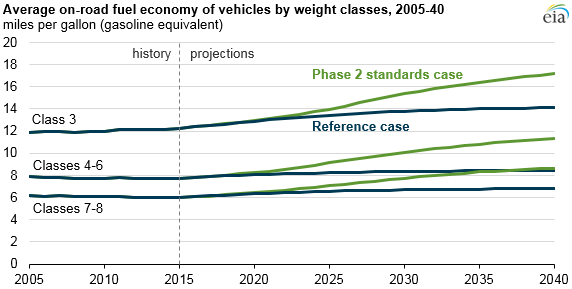 The proposed Phase 2 standards—issued jointly by the U.S. Environmental Protection Agency and the National Highway Traffic Safety Administration—would take effect in model year 2021 for most medium- and heavy-duty vehicle classes and increase in stringency through model year 2027. These standards are projected to reduce diesel consumption by 0.5 million barrels of oil equivalent per day (boe/d) by 2040. As described in an Issues in Focus analysis as part of EIA's Annual Energy Outlook 2016 (AEO2016), the proposed Phase 2 standards address specific vehicle categories, including combination tractors, heavy-duty pickup trucks and vans, vocational vehicles, and, for the first time, trailers. Vehicles are divided into different classes based on their gross vehicle weight rating (GVWR). Light-duty cars and trucks (typical passenger vehicles) weighing 8,500 pounds or less make up classes 1 and 2a (Class 2 is divided into 2a and 2b), and are not regulated by the proposed Phase 2 standards. These light-duty vehicles make up most of the vehicles on the road and accounted for 59% of 2015 transportation energy consumption in the United States. The Phase 2 standards affect classes 2b through 8, covering the medium- and heavy-duty vehicles that accounted for about 20% of U.S. transportation energy consumption in 2015. Heavy-duty pickups and vans, such as 3/4- and 1-ton pickup trucks used on construction sites, include class 2b and 3 vehicles with a GVWR between 8,501 and 14,000 pounds. They would be required to meet an annual 2.5% per year reduction in allowable emissions from model years 2021 to 2027. Vocational vehicles include a wide range of truck styles, such as delivery, refuse, utility, dump, and cement trucks, as well as school buses, ambulances, and tow trucks. This category includes class 2b through 8 vehicles with a GVWR of 8,501 pounds and above. A 16% reduction in carbon dioxide (CO2) emissions for diesel-powered vehicles would be required, with lower reductions in emissions for gasoline-powered vehicles and exceptions for certain vehicle types. Combination tractors—semitrucks that typically pull trailers—are class 7 and 8 vehicles with a GVWR of 26,001 pounds and above. They would be required to reduce CO2 emissions by up to 24% compared to the model year 2017 baseline. Trailers were not regulated in Phase 1, but they would need to improve aerodynamics and rolling resistance with different stringency depending on the type. 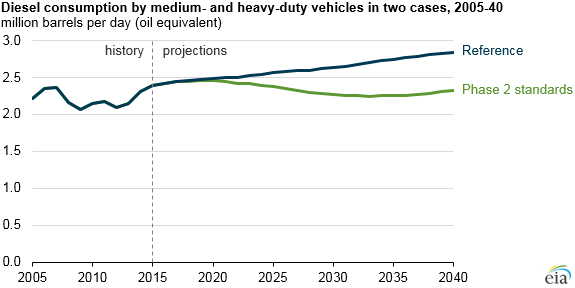 By 2040 the average fuel economy of new medium- and heavy-duty vehicles across all regulated classes would reach 10.6 miles per gallon gasoline equivalent, representing a 33% improvement compared to the Reference case. Because vehicles can last for decades, the turnover of the vehicle fleet is relatively slow, although newer vehicles are often driven more intensively than older ones. Consequently, the average fuel economy of the entire fleet increases more gradually. In the Reference case, total fleet medium- and heavy-duty vehicle fuel economy only increases slightly as vehicles manufactured under Phase 1 standards become fully adopted. Small changes in fuel economy measured in terms of miles per gallon (mpg) at the lower end of the range can have outsized effects. For instance, switching from an 8-mpg vehicle to a 10-mpg vehicle provides a fuel consumption savings of 0.025 gallons per mile of travel—the difference between 0.125 gallons used to travel a mile in the 8-mpg vehicle and 0.1 gallons used by the 10-mpg vehicle to travel the same distance. In contrast, starting with a 20-mpg vehicle, fuel economy must increase to 40 mpg to produce the same savings per mile—the difference between 0.05 gallons per mile used by the 20-mpg vehicle and 0.025 gallons per mile used by the 40-mpg vehicle. This illustrates how seemingly small changes in fuel economy for large trucks can save a significant amount of fuel. For medium- and heavy-duty vehicles, the amount of vehicle travel is not expected to change significantly compared with the Reference case, so changes in fuel economy tend to be directly reflected in fuel consumption. Unlike light-duty fuel economy standards, which mainly affect gasoline consumption, standards for medium- and heavy-duty vehicles will primarily affect diesel fuel consumption. 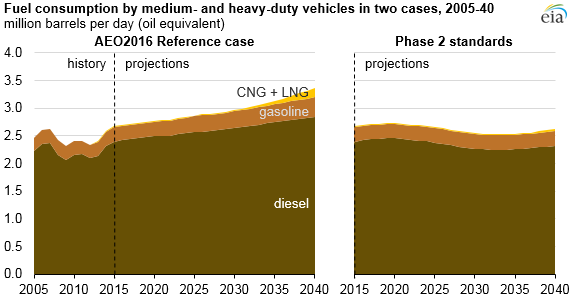 As such, diesel consumption by medium- and heavy-duty vehicles in the Phase 2 Standards case is 18% lower (0.5 million boe/d) in 2040 compared to the Reference case. Gasoline and alternative fuel consumption is also reduced, but to a lesser extent, because fuels other than diesel account for only about 10% of consumption from medium- and heavy-duty vehicles. Note: LNG is liquefied natural gas. CNG is compressed natural gas.